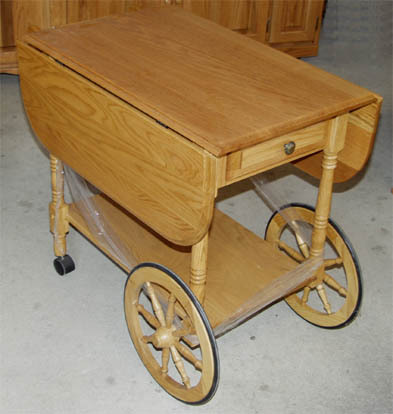 The Amish made this solid oak tea cart to be the perfect solution when you need a portable table, combining great looks and functionality. It features a table that is respectable on its own and then adds a drop-leaf on each side to make it even bigger. You can use one or both of them if needed. Then there is a handy drawer on the end so you can stash all those small items in between uses. It features two decorative wheels in the back, with rubber tires on them so they don’t mar your floors, and casters in the front, making it easy to move around as needed, and an additional shelf on the bottom adds even more storage capability - another quality Amish product offered by Clayborne’s.